In July the Council “invited” Viridor to stop construction on its Trident Park site after starting construction work without permissions to build. Following CATI's objections, they had to submit subsequent applications to meet “pre-commencement conditions” . These were published by the Council for consultation in July and public objections have held them up ever since. At the time, the council said publicly it would take “robust enforcement action” if building started before the applications were resolved, but they did not put the question of enforcement action to the planning committee till 9 January, following pressure from the Environmental law firm Richard Buxton. Despite strong arguments from Councillors for action, the Commnittee vote was tied 4:4 and so they decided to defer the matter rather than approve the officers' report. As YourCardiff reports, the council’s head of planning, Phil Williams, told committee members that although Viridor had continued with the unauthorised works wwhich is unlawful, council officers did not think enforcement action was appropriate because the detailed plans, including the pre-implementation conditions, were due to be discussed at the next planning committee meeting in February, and the issue could be resolved then. All three ward members for Splott – Councillors Gretta Marshall, Huw Thomas, and Luke Holland – told the committee that they believed enforcement action should be taken to stop Viridor’s unlawful activity, with Cllr Holland saying the firm was developing the site ” at a pace which is almost as breathtaking as [its] arrogance”. Committee member Cllr Adrian Robson said he believed it was “very clear” the council should be acting to stop the unlawful activity, while Cllr AliAhmed said that if big companies like Viridor did not comply with planning conditions, how could the committee expect general members of the public to do so. However, Cllr Lyn Hudson said it was only a short amount of time before the application to discharge the pre-commencement conditions would come before the committee again. Vice-chair Cllr Garry Hunt said he fully supported the Splott Cllrs, but would need evidence on why the current work was causing unacceptable harm to public amenity, so voted for deferral. The legal officer quoted planning law to support allowing Viridor to continue - because they couldn't say there's no likelihood of agreeing conditions – but could not say why this wouldn't apply to many other small developers who were stopped outright. No Councillor challenged his selective use of the law to favour Viridor**, just disbelief. And indirect criticisms for giving no evidence on ongoing building work and potential harm to amenity and environment that's necessary for the decision on enforcement action. CATI lobbied the Committee in September to consider enforcement action; just 4 months later after a solicitor's threat that the officers concealed, the Committee receives a shoddy report and has to defer decision. ** The primary Welsh guidance, Planning Policy Wales specifies (3.8.1-3) enforcement against developments that unacceptably affect public amenity or the existing use of land and buildings meriting protection in the public interest, which needs to be effective and timely; prompt initiation of action may be necessary to prevent an unacceptable breach of planning control from becoming well established. Just have a look back to 2010, questions we still have no answer to..we know Councils will be paying £166 a tonne when other councils in UK are paying only £56 a tonne to wastefully burn their rubbish. The NOT GREEN Prosiect 'Gwyrdd' = project massive incinerator (Gwyrdd is welsh for green!) The 2nd joint scrutiny meeting is tonight! Minutes of last meeting!! This was their first meeting and minutes tell you Zilch! Has the financial assessment been revised to take into account the falling tonnages of residual waste (rather than increasing tonnages assumed)? Has a financial assessment been calculated for scenarios in which residual household waste meets the targets given in the draft new Waste Strategy for Wales (maximum 295 kg per inhabitant per year in 2012-13, decreasing to 150 kg per inhabitant per year by 2024-5)? what is the risk of choosing Viridor-type incineration, if incinerator bottom ash is found to be hazardous waste (cf. the EA says this is to be taken as the default) ? what is the risk if CO2 from incineration is counted(it isn't at the moment) as adding to the carbon-footprint of 'waste management/disposal', as needed to conform with the EU ETS scheme, whereby the waste sector has to reduce CO2 equiv emissions by 16% (2020 levels compared with 2005)? "reporting the Final Business Case (FBC). The FBC will not be proposed to Members for a decision for 18-20 months or more from now, the procurement is expected to take that long." "Whichever way this Project is assessed, there are very significant affordability issues"
and in para 8.11.8. 9 "Given the magnitude of the ‘Gap’ that arises under both options, it is clear that partnering authorities will face a significant financial challenge to manage their future residual waste arrangements, irrespective of the final option that is chosen." Planning Breach at Viridor incinerator, South Wales Echo 29th Dec.
Cardiff Council has known Viridor is in breach of planning law (Echo 27 December), ever since they started piling for foundations on 20th July. Despite publicly promising “strong and appropriate” measures to enforce the law, Council officers sought to agree Viridor's proposals for meeting strict “pre-commencement” planning conditions. 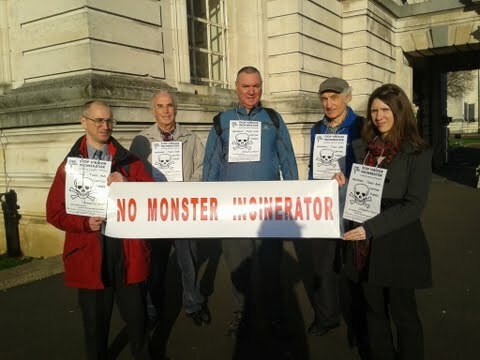 Officer notes of a private meeting with Viridor on 19th July showed no action while they published Viridor's proposals,n which they then withdrew from the 15th August Committee in the face of strong objections from Cardiff Against the Incinerator and others. The Council then paid for legal and technical advice, which accepted much of the objections. They have kept secret notes of a second private meeting with Viridor on 30 October, but their resulting letter of 2 Nov. said the development was at the company's risk and could be subject to enforcement action. Yet the officers in practice delayed action and proceeded to publish incomplete answers from Viridor in December. Viridor admitted the site does have a flood risk. This has not been planned for, despite waste incineration being classed as vulnerable by government, so should be sited elsewhere. Second, Viridor refused to answer that their incinerator ash would be hazardous waste, which could not be processed on site (and thousands of tonnes stockpiled). Viridor had falsely claimed their incinerator ash to be “inert”, which the technical advisors Atkins say is wrong. Thus the documents on file show the Council leant over backwards to meet Viridor's proposals, but cannot within the law. They are now obliged to concede CATI's demand from July, backed by the top environmental law firm Richard Buxton, and stop Viridor's unlawful construction. This vindicates politicians who have who have declared the Splott site is the wrong place for a waste incinerator, a few hundred metres from new residential blocks in Cardiff Bay and Splott and even closer to the new Ocean Way office developments including the Western Mail and Echo's.